All continuous tenses show an action that is going on. Present participle form of the verb is used in sentences of all continuous tense. Each continuous tense has its own helping verb according to the time of an action. Let’s us start learning our today’s lesson. Today. 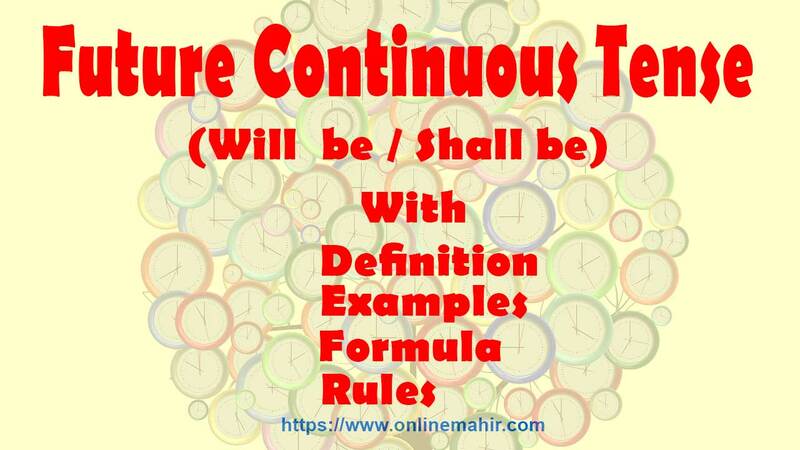 I am going to teach you all about “future continuous tense in Urdu”. An action that will begin in a moment of future, will be going on, for a while. And then will finish after action will be done. I will be teaching after a moment. It means I will start teaching after a moment, I will be teaching for a while. And then I will stop teaching when the lesson is over. Present participle form of the verb is used for this tense with helping verb “will be” or “shall be”. Three kinds of sentences are usually used for this tense. Let us deal with them one by one. An affirmative sentence is a simple general statement. Neither is it a negative statement nor interrogative. If “I” or “We” come as a subject in a sentence, we will use helping verb “shall be” with present participle form of the verb to make an affirmative sentence. “will be” is used with he, she, it, you, they and singular and plural nouns. I shall be sleeping at 12 o’clock tonight. We shall be sitting on the beach this weekend. Ahmed will be playing football this Sunday. Boys will be leaning their English lesson. When we don’t want to do things and refuse them, we use a negative sentence. “not” is put between “will” and “be” or “shall” and “be” to make a negative sentence of future continuous tense. “will be” or “shall be” is used accounting to a subject of sentence. I shall not be sleeping at 12 o’clock tonight. We shall not be sitting on the beach this weekend. They will not be waiting for us at the bus stop. Ahmed will not be playing football this Sunday. Boys will not be leaning their English lesson. An interrogative sentence is used to ask a question. “will” or “shall” always come at the beginning of the sentence, after it subject of the sentence, then “be”. A question mark “?” is put at the end of the sentence to make an interrogative sentence of future continues tense. Shall I be sleeping at 12 o’clock tonight? Shall we be sitting on the beach this weekend? Will they be waiting for us at the bus stop? Will Ahmed be playing football this Sunday? Will boys be learning their English lessons? Note: affirmative and negative sentences are begun with a capital letter and it ended with a full stop. Interrogate sentence is begun with the capital letter and it ended with the question mark “?”.